For anyone wishing to view the details of Inkpen's graveyards, including burial details, grave stone inscriptions and the location of the graves, please click here. Can there be anyone living in Inkpen who hasn't been up to the gibbet ? Not only can you see for miles and miles but you can watch the hang gliders and paragliders circling high above the ancient burial mound and gibbet. You can listen to the skylarks, breath clean fresh air and amble a hundred yards or so, along the Wayfarers Walk to Walbury Hill Fort. The sense is of rural beauty and tranquillity. Well, Inkpen is a beautiful place which is why it's officially classified as an area of outstanding natural beauty. What you may not realize is just how much of our historic legacy you're walking on. All this used to be part of Savernake forest, whose remaining great oaks are just a few generations removed from their Ice Age ancestors. In fact, the forest was one of the first landscapes to appear when the last Ice Age receded and dates back at least 10000 years. The Ice Age is also responsible for deposits of heavy clay soil found in Inkpen that give rise to the boggy lowland areas (which some of us still enjoy today). From up here on the hill top you can still see pockets of that ancient woodland scattered in and around Inkpen, and with a bit of imagination, you can visualize what the view from up here might have been. Much of the clearance of the forest was done by the Saxons and the first written record of the forest was made in 934 AD by the Saxon King, AEthalstan, who referred to it as "the woodland called Safernoc". More of him later. The earliest sign of habitation in Inkpen dates to the Mesolithic period. That's between 10000 to 4500 BC. There is just the one find, to the west of the gibbet. The traditional view of Mesolithic people is that they formed small groups following known trails through the forested countryside, often along hill tops. Their trails were cyclic, following the seasonal movements of animals, ripening fruits and plants. Within this scheme of things, these hunter-gatherers may have attempted to manipulate these resources through forest clearance. We know that there were people living up here on the hills some 5000 years ago. That's around the time Stonehenge and Avebury were built (the construction of both of which has been attributed to the beaker people). Beaker people pottery finds in Inkpen, at the Hungerford end of Craven Road, opposite Colnbrook copse and up here on the hills, date from as early as 3000BC. The pottery found isn't some jigsaw of scraps either. The clay pots are near intact and quite beautiful. They show skill and artistic design and now reside at the Newbury Museum. If you haven't already seen them, go and have a look, it will help you to get to know the people whose land you live on. Other early beaker people finds have been made close to the old saw mills at the end of Folly Road. These comprise flint tools, and evidence that suggests that they were manufactured near by. The pottery finds at Craven Road, that's the left and centre photos shown below, were found in a layer of sand close to where the Ingeflod (an ancient brook) would have been. Those who are familiar with the Hungerford road during very wet weather will no doubt have experienced flooding at the bottom of the hill as you go out of Inkpen. Sometimes there's enough water to re-enact the meanderings of the Ingeflod through the fields to the northeast, just as it did during the time of the beaker people. It seems likely that beaker people lived around here, possibly in round houses and using the fertile soil for crops and livestock grazing. Back in 1908, some trenches were dug at Sadlers Farm (the site of a barrow which had been ploughed over). In these trenches were found a large quantity of animal bones and horns, and some human bones. Also some early or pre-Romano-British potsherds were found. At the time these beaker people walked the hill tops, their views would have been of dense woodland forest and boggy marsh land. Venturing out into the surrounding low lying areas was fraught with danger. Wild boar and wolves roamed freely, and maybe the odd human predator did too. Nevertheless, journeying down, maybe to the settlement at Ingeflod, was essential in order to get fresh water. 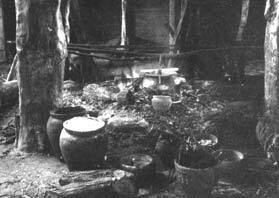 The beaker people are credited with breaking the mould of nomadic existence by "settling" to farming. So, not only were the beaker people the first settlers of what has now become Inkpen, but their being defines its existence. Again, the Newbury Museum has a number of bone tools and a bronze knife that date from beaker people times, and were found in Inkpen. Evidence of an ancient field system is still visible not far from the long barrow. The beaker people are defined by their pottery, but they also made the first woven garments in Britain and seem to have introduced the first alcoholic drink into Britain, a form of honey-based mead. They were a warlike, patriarchal society, and it's during the Bronze Age that the notion of a warrior-chief or king emerged. Early (neolithic) beaker people buried their dead in simple stone mounds we call round barrows, often with a beaker alongside the body. Several of these remain on the hill top to the west of the gibbet. Four were explored in 1908 and small urns with burnt human bones and neolithic tools were found. 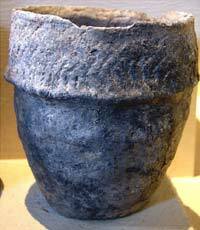 The burnt human remains suggest cremation, a known neolithic practice. Later, in the bronze age, communal "long barrows" were used, like the one under the gibbet. The bodies of the dead may have been left to rot, or for carrion, in order to reduce the bodies to skeletons. The bones were then collected and buried. Both men and women had barrow burials but, there was a difference. Studies show that in many cases the corpses were carefully assembled with the head to the south, men facing east, women facing west. Whether this is the case in our long barrow, we don't know, though the long barrow is on an east-west alignment. The next big thing to hit Inkpen was the iron age, where burial mounds and circles gave way to hill forts and permanent fields. Walbury iron age hill fort is on the hill top adjacent to that used by the gibbet and long barrow. It was built in around 600 BC and remained in use till about 50 AD (about the time the Romans arrived). The construction was obviously an enormous feat in its day, with its massive encircling banks and ditches. It would have been defended by a timber fence or palisade and populated with round houses with perhaps pens for the livestock. You can see the outline of the hill fort, centre right, on the picture below. You will also notice what a commanding position it has relative to the hill-top tracks. Walbury hill fort was built, partly in response to the increasing importance of the tracks for trade and the movement of livestock, and for the protection of the locals from attack by warring groups. The encampment marks the high point of the chalk downs at 975 feet, and covered some 80 acres. As well as pottery finds at Walbury Hill, Saxon coins or "sceattas" (treasure) have also been found. In addition to the hill fort and barrows, there is yet another historic landscape feature. 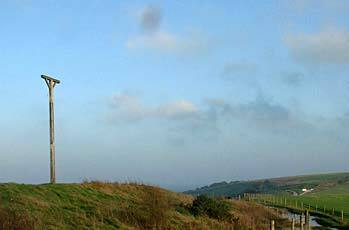 At the foot of the Inkpen beacon lies the eastern end of the "Wansdyke". 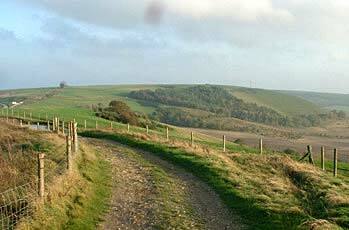 Wansdyke is a long ditch and bank, also known as a "linear defensive earthwork". Its construction is dated somewhere between 400 and 700 AD but most likely around 470 AD when the ancient hill forts were also being refortified. It runs east west, from the Inkpen beacon all the way to Portishead near Bristol. When the Saxons came upon it, they named it after their god Woden, hence it became "Woden's Dyke", and eventually, Wansdyke. It is in the same league as Offa's Dyke and Hadrian's Wall, and is one of the largest defensive earth works in the UK. Its construction clearly points to danger from the north, though the exact source of the danger is not known. Nennius, an 8th century Welsh monk who had access to 5th century chronicles (long since lost), describes these defences and their purpose, and links them to the legend of "the mighty King Arthur". Nennius is not regarded as a particularly reliable source, but his access to the 5th century chronicles means that his writings can't be totally dismissed either. At this point, you're probably wondering why I've missed out the Romans. Well there wasn't much, other than the Bath Road to remind us of local Roman activity. We know that they policed the local quarrelling tribes and that some of the hill trail trade was diverted on to the Bath Road. We know that the Romans lived in this area (there's a roman mosaic at Littlecote, for example) but until recently there was nothing to show any more "local" interest. In 1984, on our side of the Gibbet, down towards Lower Green, finds were discovered which suggest the presence of a Roman dwelling of some kind. 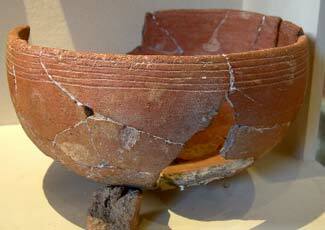 Then, during building work near Combe in 2003, a Roman burial was found. More on these finds as information becomes available. The Romans left Britain in around 400 AD. The Britons had relied on the Romans for security and in their absence, chaos overtook the land. Saxon mercenaries from Denmark and Northern Germany were invited to help sort things out, but a reluctance to pay them led to an eventual invasion by the Saxons. Life in Berkshire reverted to a comparatively primitive state with people returning to farmstead life, living in simple round houses. These Germanic Saxons settled around Abingdon and soon gained political ambition, carving out kingdoms for themselves. One of these was Wessex which eventually covered the area now taken by Berkshire, Hampshire, Dorset, Wiltshire, Somerset and Devon. The north of Berkshire was particularly associated with the early Wessex kings. In 634 AD St Birinus gained the permission of King Cynegils to convert his people to Christianity and about 675 AD Abingdon Abbey was founded. Minsters soon developed from which priests were sent out into the countryside, some taking up residence in Kintbury. Wessex is derived from West Seaxe, (West Saxons) and similarly Suth Seaxe (Sussex), Middel Seaxe (Middlesex) etc. By 850 AD, England comprised 3 competing kingdoms; Wessex, Northumbria and Mercia. In 860 we get the first mention of Berkshire, then recorded as Berrocshire which is of Celtic derivation. It consisted of two areas, one to the east and the other the north and west. In 849 AD Alfred, prince of Wessex was born. He became King in 865 and from our point of view, his most important legacy was written records. 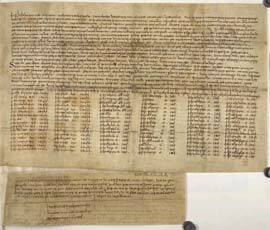 One such record, the Cotton Charter viii, dated 931-939 AD includes the will of the Saxon, Wulfgar, (the name means wolf spear). This was in the reign of AEthelstan 924-939. Wulfgar wishes "the land at inche penne" to be divided on his death, with three quarters going to his wife AEffe, the other quarter going to "the servants of God" at his holy place, Kintbury (spelt Cynetanbyrig in the 10th century, Kenetebury in the 13th century). Wulfgar adds to "the land at inche penne" the words, "which I had from Wulfric, who had it from Wulfrere who first owned it". Wulfric was Wulfgar's father and Wulfrere, his grandfather. Following AEffe's death, her share was also to go to the holy place at Kintbury, "for the souls of Wulfgar, Wulfric and Wulfrere". In another charter, Wulfgar is given additional lands at Ham, but there extent, location and what happened to them I don't know. The similarity between inche penne and Inkpen, is clear, particularly when taking account of changes in language and pronunciation over the years. You can see here just a few of the different spellings of Inkpen and how it varied over 300 years or so. This is because the writer of a document was probably taking dictation, as opposed to copying from another document, and had to interpret the sound of the name for himself. It's sort of an early form of Chinese whispers.